My book Record and Play consists of six chapters devoted to music, memory and mixtapes, so when the Liverpool music magazine Bido Lito suggested I might write a seventh mixtape piece specially for them, I was happy to oblige. Originally published within their pink pages, this spectral Liverpool tale can now be told here too. There are things you expect to find in a cheap hotel room. Translucent white soap wrapped in thick waxed paper. A packet of shortbread. Nescafé by the sachet and a teabag or two. But what you don’t expect is a shimmering 1980s Walkman lying on the bed, its orange sponge headphones looking good enough to eat. Tastier than the shortbread at any rate. That’s why I pause as I step into the room and notice it nestling on the duvet. For a moment I wonder if the space is already occupied, but blinking through the murk and snapping on the light, I can see that the bedding is tucked in and the room is clearly undisturbed. A loaded cassette machine on a hotel bed. I decide there’s only one thing to do. The headphones clasp my ears in their synthetic-sponge grip; it feels like a cuddle from an old and forgotten friend. This is 1995 after all – my first night in Liverpool, in a hotel room paid for by my new employer – and the orange audio earmuffs already look like history’s off-cuts, as out-of-time in this grimy Gallagher-scented world as leg-warmers and Adam Ant. And once they’re in place, my hand moves automatically: my fingers find the PLAY button, and before I know it, the tape’s concealed mysteries have begun their evocative journey through my head. “Welcome to your Liverpool Ectoplasmic Audio Guide. If you have found this cassette, you have been selected to participate in beta testing of our prototype system – a phantom musical journey through your future in our city. We begin where you came in – at the Burger King at Lime Street station, half an hour ago. You can picture it, as if it’s happening as I speak. You have just arrived from Sheffield with your girlfriend: you to begin a new job, a new life perhaps, while she has simply accompanied you on the journey and now waits for a train back home, wondering whether circumstance is about to drag you apart. You are excited; she thinks the end might have come. You scoff a spicy bean burger; she gazes into her coffee and listens to the record that’s playing. It’s this record, a song whose melancholic crimes could induce a fatal rush of metaphor to the heart. And that’s exactly what happens; while it doesn’t register with you as you wipe ketchup off your chin, the sentimental soundtrack leaves your girlfriend feeling shattered and in pain. You are oblivious, but as you swallow the last of your meal and prepare to kiss your girlfriend goodbye, you are leaving more than a gust of partially-digested onion in the atmosphere between you. She feels it rushing through the air before it hits her. No more I love you’s: it delivers an emotional punch worthy of a different breed of Lennox altogether. “Lime Street fades. Fortunately your relationship… doesn’t. And you and your girlfriend are back in the city, this time picking your way down Hanover Street past buffed and waxed humanity; the toned and tanned and tawdry all out on the town. You’re in Rosie O’Gradys, a low-ceilinged cellar bar that sits a half-storey below the street. At the bottom of the steps you come up against a dense pack of dazzling bronzed specimens with spirits up, hair down, bottles of Labatt’s Ice clutched in their fists. You buy booze and attempt small-talk with the people you now work with – new friends with mysterious lives. But it’s impossible to hear anything they say. There are two lads in the corner – one on keyboard, one on guitar – with a repertoire of pop-rave anthems they must have purloined from a service-station dance compilation. The volume is impressive: the singing is not. “Here’s your answer. Three years in the future, you’re in a strobe-snapped bunker with camo drapes across the ceiling and there’s a machine gun firing blanks in your skull. The room is tight and dark; it’s crammed with bodies, each one writhing, twitching, beaming. And over and above this grinning mass there’s a black man playing records, green swimming-cap on his head, and as he surveys the crowd and is pleased with what he sees, he begins to recite a deadpan prose-poem into the upturned ear-piece of a pair of headphones. But this is not Club Bad. This is Voodoo, in Liverpool. It’s Club Good. It’s where you drink Evian, hug strangers and partake in the pummelling techno hypnosis that’s part shamanic ritual, part hedonistic rush. And part just a bloody good laugh. Green Velvet is the twisted disco alter ego of Curtis Jones from Chicago. And this track, Flash, is a malevolent joke of a tune, a smirking stab in the back that both celebrates and sneers at this scene. You get the joke but you also submit to its enormous groove, as does everyone else in the room; for this might be the ultimate Voodoo moment, the peak which it will never surpass. And as you leave with your girlfriend by your side, she tilts her loved-up grin towards yours. ‘Amazing,’ she says, and you agree. “And here’s a house, a tiny two-up two-down in Aigburth Vale. It’s the home where you and that girlfriend of yours, now wife remember, have sunk the coins and fluff and rubber bands that passed for savings, and it all belongs to you. And the Halifax Building Society. It’s late at night, or early morning; hard to tell. You stand in the middle of the living room floor with crumpled eyes and sagging heart. You’re tired; wiped out. So why not go to bed? Squint a little harder through the sodium half-light and it’s clear to see why you remain here, gently rocking. Over your shoulder and in the fold of your chin there’s a baby. He sleeps, at last. And it seems that as long as this deep roots rumble spills from your speakers, and you ride that gentle rocking rhythm back and forth, he will stay asleep, content to curl up on his dad. It took a while to reach this point. You arrived home from the hospital with a human being in your hands, and placed his basket on the floor and shut the door and realised he didn’t come with a manual. So when he whined and shrieked well into the night, and wouldn’t drink and wouldn’t play, you plumped for the gentlest sound you know. And in that moment of not-quite-awakening, you realise you’re no longer alone in a house, but are now one of a crowd in a school. You rub shoulders with the middle aged: they are the balding, the baggy-eyed and tired, and you realise for the first time that you belong with them; these are your people. You are parents perched on polyprop chairs, and in front of you are your kids parked on brown varnished benches. In a hall that usually hangs heavy with insolence, disinfectant and cabbage, today there’s some prize giving; there are speeches; there’s talk of exciting careers yet to come. Then the headteacher, centre stage, scans the room and sighs. Another year group is about to fade from his life, heading for education’s next stage. As the kids nudge and wink and stifle their chatter, another teacher scuttles over to a hefty old CD player and jabs a button. There’s a booming strum of acoustic guitar as the intro kicks in far too loud; there’s frantic knob twiddling; some stern glances. Then Peter, Paul and Mary begin their song, over-earnest perhaps, in a style from which it’s easy to take the piss – and before you know it, the kids have joined in and are belting out Leaving on a Jet Plane at the tops of their voices, hammering home to their mums and dads the fact that one day, rather soon, they’ll be gone. “Hope Street; a dappled morning; the approaching wallop of a marching band. Maybe it’s an Orange parade you think, or one of those scouse samba groups that have stalked the streets ever since Capital of Culture set them free. But then you realise, as you cross junctions drawn in pixellated cobbles, that the drumming and trumpets are all in your head. Performed by the poetry/rock hybrid The Liverpool Scene, they carry with them a 1960s Liverpool echo – the voice of Adrian Henri reading his most evocative poem. You and your family pause at the top of Mount Street and you glance across at the Georgian terraced house in which your favourite poet once lived. He’s your favourite poet because he isolated the ephemera of his life and cast it adrift on a stream of melancholic thought – a stream piped from Liverpool gutters, from Mersey rain. A ghostly parade passes by, conjured up by Henri’s poem; it’s not Orange lodge or samba crew, but a gathering in honour of a kitchen-sink Christ with greasy locks and chip papers round his feet. And as the spectral figures brush against your thoughts, and move on towards the Philharmonic, the Everyman, the Cathedral, you realise that this really is home now; for you, for your family… forever? The music tails off; the images fade. Your Ectoplasmic Audio Guide is over. Thank you for listening. Please rewind the cassette and leave the player in its original location. You may like to know that our future plans include a past/present/future Christmas special, and cloud-based guided spirit journeys via an online streaming service. And with that, the sound cuts out; the cassette judders to a stop. I open my eyes and feel for the headphones, for the Walkman, for its chunky controls: I want to rewind and replay, to hear it all again. I want to know if it has really foretold my Liverpool future; I want to know if I can believe what I’ve heard. But rather predictably, there’s nothing there. So instead, I fill the mini kettle and listen to the music of its hectic, rolling boil, then I burst open the shortbread and sip Nescafé milked with warm UHT. My mind is all a-tumble; my thoughts seem woozy and stretched. There are marriages, children, new houses; there are Liverpool streets that I don’t yet know. But there’s something else too, another thought that just won’t let go. It isn’t the wife or the baby, the clubbing or the kids. It’s… that thing they said. They’re words that seem like English, but together, they make no sense at all. I shrug to myself, weary and puzzled. Then I curl up on the sheets, and drift off with the city telling tales in my head. 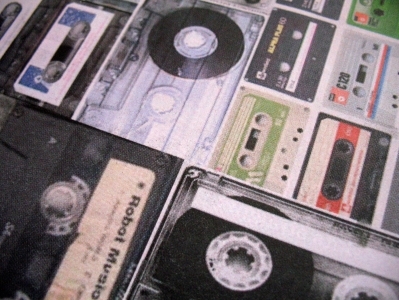 My book, Record and Play: Music, Memory and Six Imaginary Mixtapes, is available to buy here. 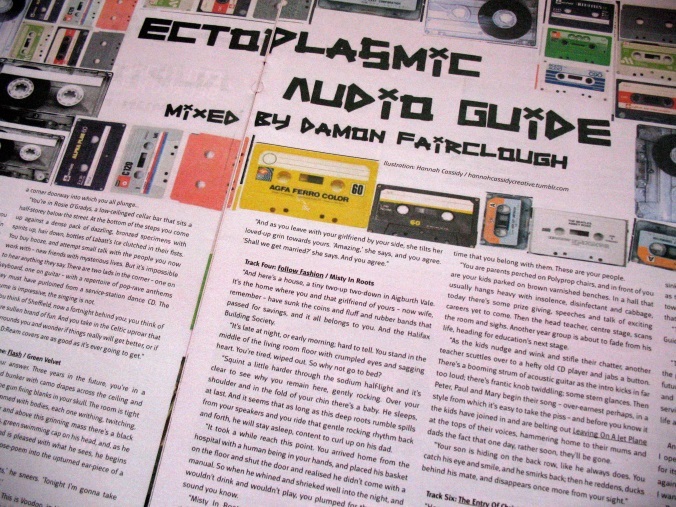 The Ectoplasmic Audio Guide is available as a Spotify playlist here.